Meredith Whitney is predicting 300 additional bank failures, putting continuing pressure on the FDIC. The FDIC insurance fund, which may already be in the red is going to require more taxpayer funds. Many of the smaller banks played the same game that the Wall Street firms have, chasing more spread and loading up on real estate related assets. 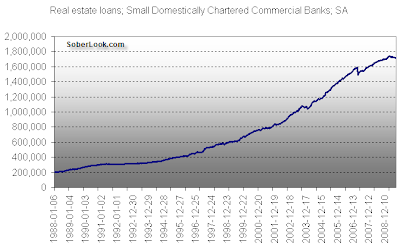 The chart below shows rapidly expanding real estate loan balances at small US banks. In fact in some ways many of the smaller banks have been more aggressive on their portfolios than the large ones due to limited devirsification. Now it's the taxpayer's problem.